Do you know which devices are connected to a wireless network that your computer or mobile device is connected to? Knowing this can be very useful in several situations. It can be helpful to troubleshoot connectivity issues for example, check the IP addresses and network names of devices quickly, or to make sure that no neighbor or third-party managed to crack the password to use your wireless network without authorization. Fing - Network Tools for Android is a great application for all Android devices version 2.1 and up that lists the connected devices in a matter of seconds after start. 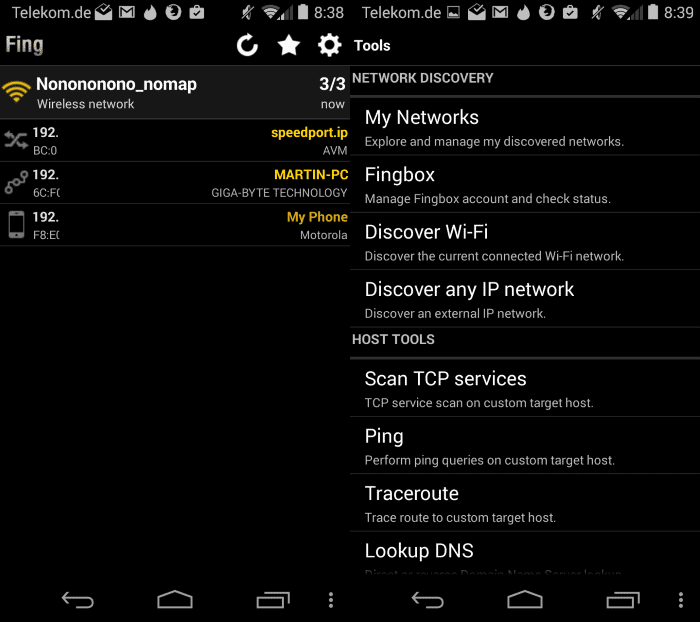 The app displays the wireless network the Android device is connected to and the IP address (IPv4) and Mac address of other devices as well as their network name and manufacturer. A tap on any of the devices displays detailed information about it. This includes IP and MAC address, hostname, vendor, and first time it was recognized on the network. A set of tools are provided that you can run right from there as well. Supported are ping and traceroute for example, and a scan of supported services on the device. This displays the open ports and their functionality again with options such as testing the connection or opening a browser to connect to the device. Another interesting option is that you can add a name and notes to devices. It may for instance be useful to add descriptive names to cryptic devices so that you know what their purpose is (print server instead of Wintermute for instance). Doing so replaces the actual name of the device. The preferences of the application display quite a few options as well. Preferences are divided into tools that you can run from there right away, host tools to run traceroute or wake on lane commands on any network address, general configuration preferences and backup and restoration options. You can use the network discovery part to scan the wireless network you are connected to, check your networks that have already been discovered, and discover an IP network by entering an IP address or hostname and ports. General preferences include options to set the maximum network size and to add or remove TCP services (ports). This can be useful if you need to check custom ports or don't require the scanning of supported ports. Fing - Network Tools is a useful application for Android that comes in handy on several occasions. From checking the wireless network quickly to make sure it is free of intruders to using it to troubleshoot connection problems in the local network. thanx for publicizing this gem. I think you should change the title to Fing instead of Find..
Do they collect information of the network? popped it on my iphone and for a moment thought eek! then realised that the extra item was the router!